"The information in Destiny Cards is right on!" This book can be downloaded, viewed and you can print your own hard copy! This book is a must for serious students of metaphysics and the cards. A transcription of a lecture given by Robert at a teacher training, this book illuminates the real meanings of the numbers of the cards and how these numbers come to mean what they do in real life. Each card in the deck is discussed and how their numeric values reflect on both their meanings in a Yearly Spread as well as the personalities of the people who claim those Birth Cards. See also the Inside the Meaning of the Cards series for more of this same kind of information. Want to learn the meanings of the cards in the shortest amount of time? Then do your Weekly Readings! It has complete instructions on how to perform the Weekly Reading and how to optimize it for your own education. 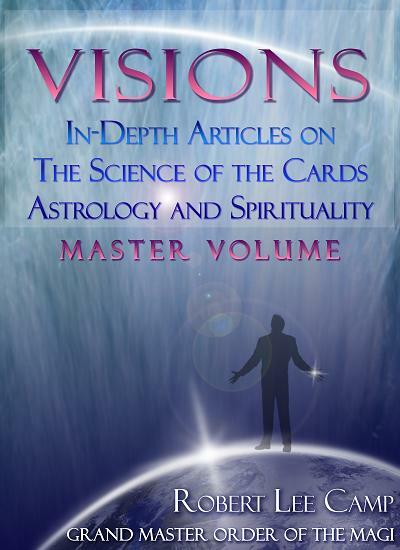 In this book are a complete set of interpretations for the cards in the Weekly Reading, including the Environment Card, which is an addition to the Weekly Reading taught in Destiny Cards. You will also learn the new technique of how to do the timing and shuffle of the deck to guarantee its accuracy and relevance. The book also has complete instructions on how to perform a Decision Reading, which you can use to help you make important decisions in your life. This new edition has included some articles about the weekly reading, 8 new pages. Now, for the first time, you can get all the Visions volumes (nine total) in one beautiful and insightful EBook. This is the complete edition of all of Robert’s articles spanning nearly 20 years. These nine volumes normally cost $140 if purchased individually. Instant delivery and no shipping!